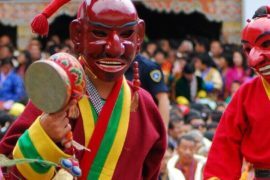 The name Simtokha signifies “on a Demon” and the legend related with the Dzong’s development discloses to us that it was worked keeping in mind the end goal to stifle a malevolent soul that was hassling explorers in the locale. The dzong houses incalculable statues and works of art of different Buddhas, gods and religious figures. 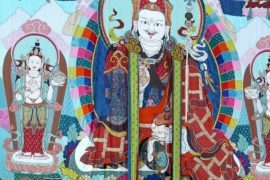 Another fascinating part of the dzong is that it contains the bed assemblies of both Zhabdrung Ngawang Namgyel and Jigme Namgyel two of the most imperative figures in Bhutanese history. Zhabdrung was the pioneer that initially joined Bhutan as a country and Jigme Namgyel was the father of the principal King of Bhutan Ugyen Wangchuck. The dzong was designed according to the Gyal Gyad Tshel Institute of Ralung (Tibet) and is very unmistakable as its Utse or focal tower has 12 sides. 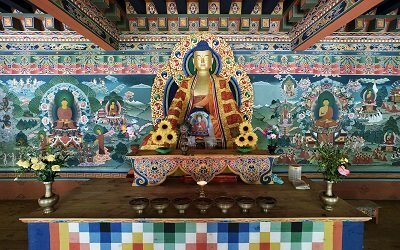 An extensive statue of Yeshay Gonpo (Mahakala) the boss defensive divinity of Bhutan is housed inside the Utse. Another fascinating part of the dzong is that it contains the bed councils of both Zhabdrung Ngawang Namgyel and Jigme Namgyel two of the most essential figures in Bhutanese history. Zhabdrung was the pioneer that initially joined Bhutan as a country and Jigme Namgyel was the father of the main King of Bhutan Ugyen Wangchuck. The dzong houses incalculable statues and works of art of different Buddhas, divinities and religious figures including The Eight Manifestations of Guru Rimpoche, Jampelyang the Bodhisattava of Wisdom, Shakya Gyalpo the Buddha of Compassion and some more, all cut and painted in stunning subtle element.